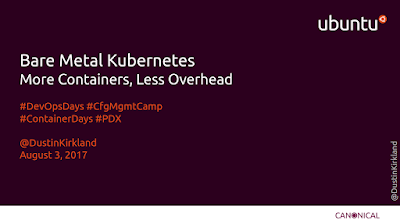 Earlier this month, I spoke at ContainerDays, part of the excellent DevOpsDays series of conferences -- this one in lovely Portland, Oregon. I gave a live demo of Kubernetes running directly on bare metal. 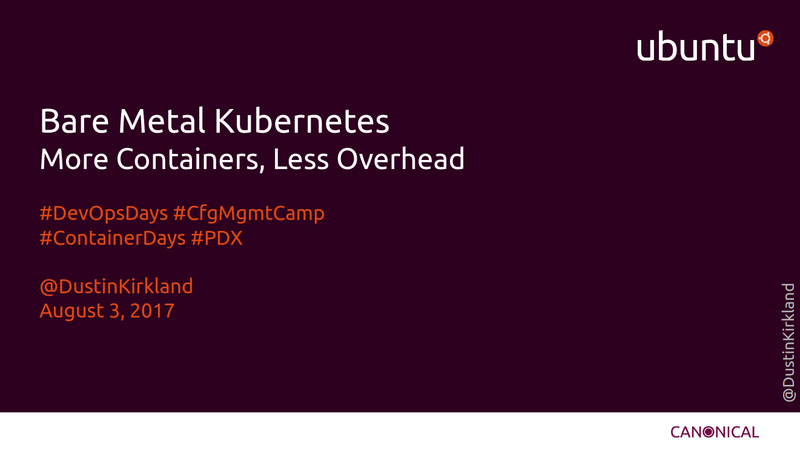 I was running it on an 11-node Ubuntu Orange Box -- but I used the exact same tools Canonical's world class consulting team uses to deploy Kubernetes onto racks of physical machines. You see, the ability to run Kubernetes on bare metal, behind your firewall is essential to the yin-yang duality of Cloud Native computing. Sometimes, what you need is actually a Native Cloud. Deploying Kubernetes into virtual machines in the cloud is rather easy, straightforward, with dozens of tools now that can handle that. But there's only one tool today, that can deploy the exact same Kubernetes to AWS, Azure, GCE, as well as VMware, OpenStack, and bare metal machines. That tools is conjure-up, which acts as a command line front end to several essential Ubuntu tools: MAAS, LXD, and Juju. I don't know if the presentation was recorded, but I'm happy to share with you my slides for download, and embedded here below. There are a few screenshots within that help convey the demo. "Should I run my PaaS on top of my IaaS, or my IaaS on top of my PaaS"? With that as your base, we'll easily to conjure-up a Kubernetes, an OpenStack, or both. And once you have a Kubernetes or OpenStack, we'll gladly conjure-up one inside the other. As always, I'm happy to share my slides with you here. You're welcome to download the PDF, or flip through the embedded slides below. 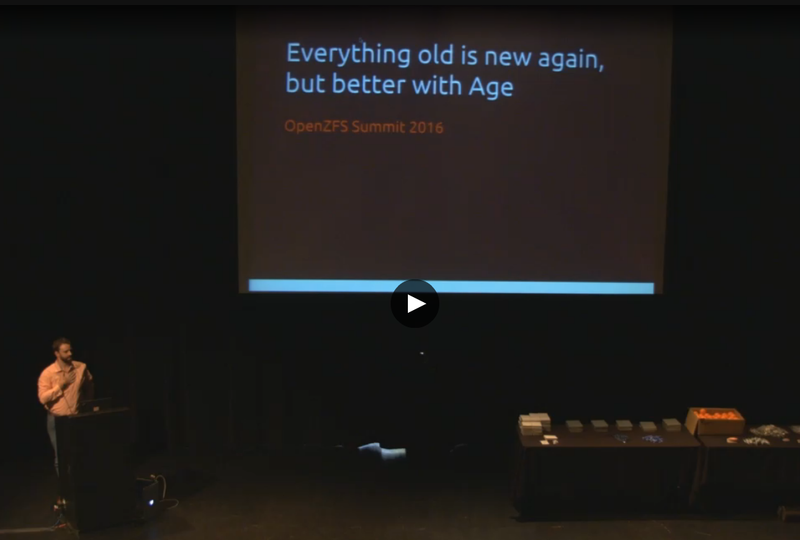 OpenZFS Developer Summit Keynote: Everything Old is New Again...But Better! On Monday this week, I was afforded the distinct privilege to deliver the opening keynote at the OpenZFS Developer Summit in San Francisco. It was a beautiful little event, with a full day of informative presentations and lots of networking during lunch and breaks. Below, you can view my slides, download the PDF, or watch the talk (starts at 31:10) and demo in its entirety. BCC is a toolkit for creating efficient kernel tracing and manipulation programs, and includes several useful tools and examples. It makes use of extended BPF (Berkeley Packet Filters), formally known as eBPF, a new feature that was first added to Linux 3.15. 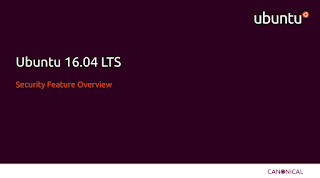 Much of what BCC uses requires Linux 4.1 and above. 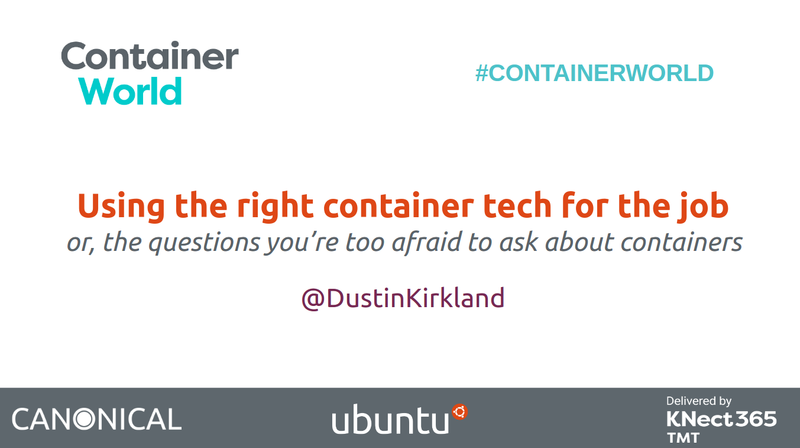 A couple of weeks ago, I delivered a talk at the Container Camp UK 2016. It was an brilliant event, on a beautiful stage at Picturehouse Central in Picadilly Circus in London. You're welcome to view the slides or download them as a PDF, or watch my talk below. 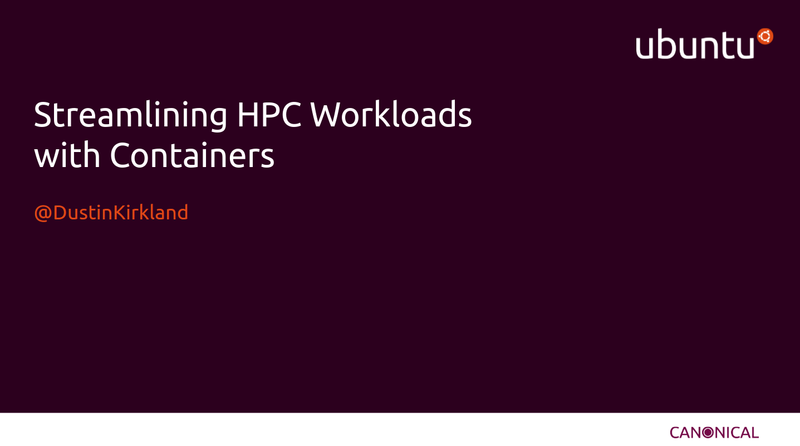 And for the techies who want to skip the slide fluff and get their hands dirty, setup your OpenStack and LXD and start streamlining your HPC workloads using this guide. I had the opportunity to speak at Container World 2016 in Santa Clara yesterday. Thanks in part to the Netflix guys who preceded me, the room was absolutely packed! You can download a PDF of my slides here, or flip through them embedded below. I'd really encourage you to try the demo instructions of LXD toward the end! As always, I enjoyed speaking at the SCALE14x event, especially at the new location in Pasadena, California! 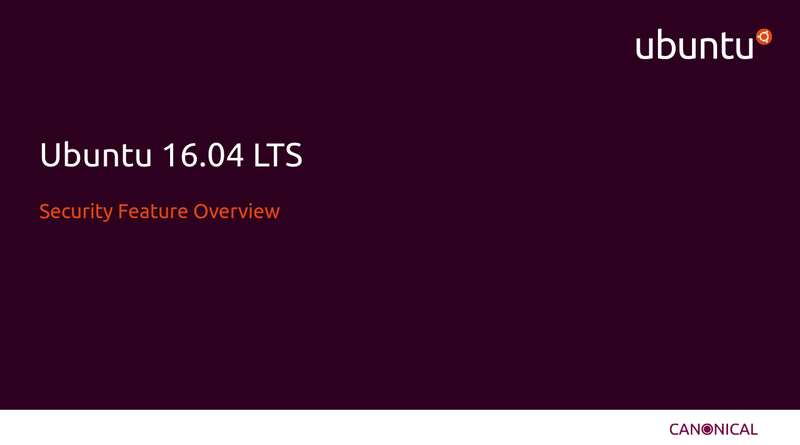 What if you could adapt a package from a newer version of Ubuntu, onto your stable LTS desktop/server? Or, as a developer, what if you could provide your latest releases to your users running an older LTS version of Ubuntu? 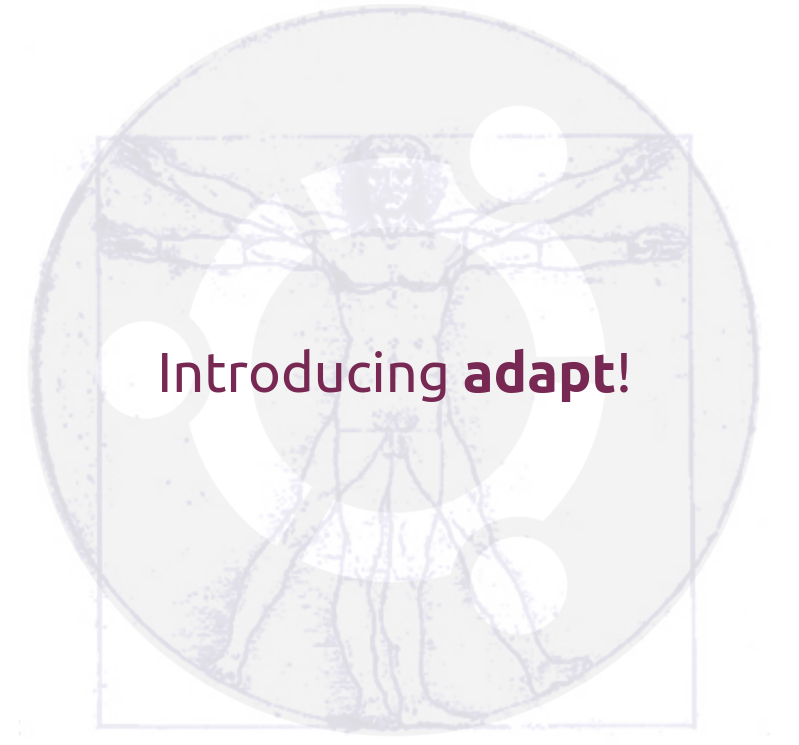 adapt is a lot like apt... It’s a simple command that installs packages. 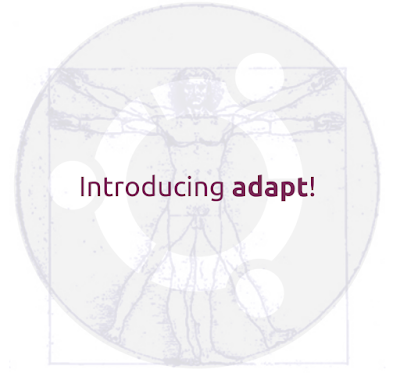 But it “adapts” a requested version to run on your current system. It's a simple command that installs any package from any release of Ubuntu into any version of Ubuntu. More specifically, LXD system containers. 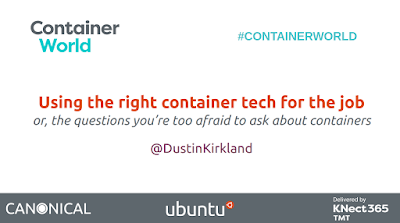 Containers can run anywhere, physical, virtual, desktops, servers, and any CPU architecture. 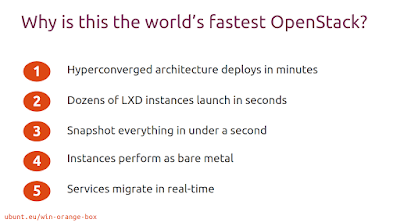 And containers are light and fast! Zero latency and no virtualization overhead. Most importantly, system containers are perfect copies of the released distribution, the operating system itself. And all of that continuous integration testing we do perform on every single Ubuntu release? Liberated Build System: Mission accomplished! and some errata for it: On slide 13 it says “the same file is also hardlinked from workdir/” — thats not true for quite a while already. LibreOffice keeps around exactly one copy of a library, unlike the confusing three copies that we had in LibreOffice 3.3. This should be a lot less confusing to the curious first time contributor. Reviewing all these changes in toto, it became how much we simplified getting involved with LibreOffice through this. As the lyrics quoted above say: “Back when we started, we didn’t know how hard it was”. If there is just one number to take away from all these slides, its that a noop rebuild for LibreOffice on a three year old developer notebook with the distro provided GNU make 3.81 takes just 17 seconds(*). 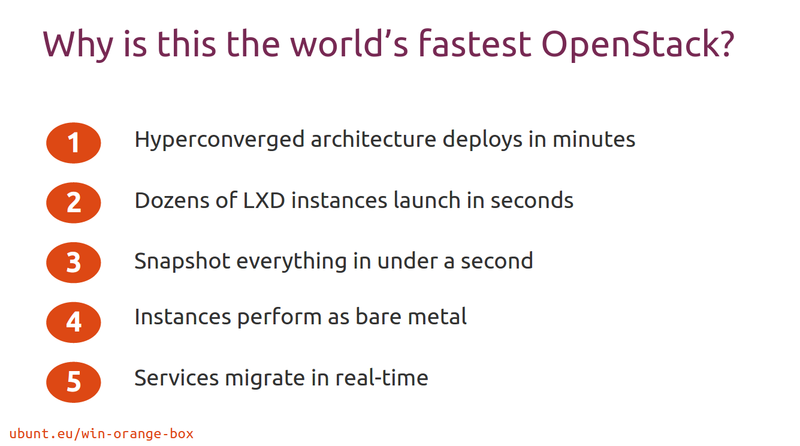 And slide 7 shows still some possibilities to still speed things up beyond that — and while at current speeds it might not be worth it on Linux, it might be worthwhile for e.g. Windows, which is traditionally rather slow when it comes to file I/O. On a related note, over time we improved the way new contributors can submit their changes on our instance of gerrit in many ways. Thanks a lot to David, Norbert and Robert for the work on this. One only has to look at one of daily digests generated from activity on gerrit and imagine we would still get one mail for each change, update and merge to the mailing list for manual patch tracking as we did in the early days. Thanks a lot also to Mathias Michel for his work on the script! So if you haven’t done that yet, consider graping an EasyHack and get started! A copy of the original .odp is also available at FOSDEM or on the LibreOffice wiki. (*) This includes checking 1.3GB of generated c++ dependency files for some >8000 object files, which we simplify to <350MB.